Kennett Square, PA — “Cent’anni” or “Chindon” is a toast Italians share to wish someone 100 years of good health. 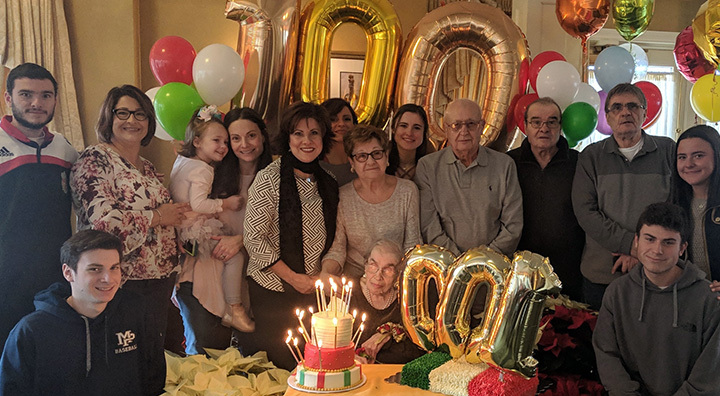 Ida Riccione – Nonnina to her family and friends — has hit that milestone. Born in Furci, Italy, on Dec. 17, 1918, Ida has certainly seen the Great Depression, the rise and fall of fascism, World War II, and the advent of too many life-changing inventions to count. That’s in addition to her own life – marriage, the births of three children, immigration to the United States, and the births of seven grandchildren and 14 great-grandchildren. Ida celebrated her milestone birthday on Dec. 17 at Brandywine Living at Longwood, her home for the past four years. The community hosted a birthday party featuring live entertainment, food and birthday cake. The Mayor of Kennett Square, Matt Fetick, came to wish Ida a happy birthday, and presented her with a certificate of congratulations. The holiday season is Ida’s favorite time of year, and she was known for baking authentic Italian dishes every December, including homemade calgionette and struffoli. She loved to cook a traditional Italian seven fishes dinner for family on Christmas Eve, featuring baccala, her favorite fish dish.